There is much to regret in the journey taken in recent decades by contemporary art — obscene prices, Walmart-sized dealerships, the rise of curator culture, the “Me Me Me” screeching of identity politics — but one area in which we can, and should, rejoice is the reinvention of public sculpture. Those of us old enough to remember when public sculpture consisted mostly of bronze turds by Henry Moore being deposited in concrete wind traps, carved harshly into working communities by modernist Cruellas, or the ruination of yet another riverside vista outside yet another provincial theatre by the positioning of yet another steel squiggle by William Pye, can only applaud the change in tone that has occurred. Public sculpture used to be pious, repetitive, dull. Now it is inventive, varied, fun. 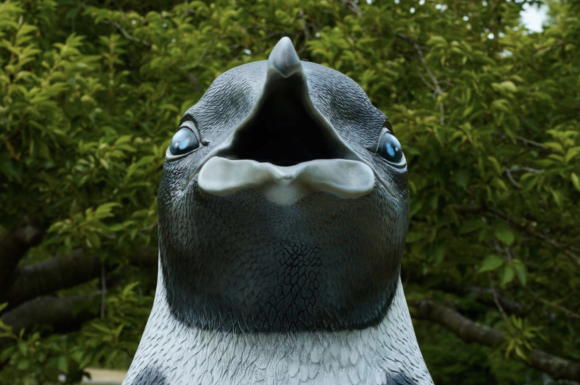 Much of the credit for this change needs to go to the Fourth Plinth project on Trafalgar Square, which has so successfully enlarged the range of sculpture. The new mood has been catching. The textural playfulness of Gillian Wearing’s suffragist on Parliament Square would have been unthinkable a decade ago. And look how soppily Tracey Emin’s outburst of romantic neon impacts now on the arrival zone at St Pancras International. It’s like being met at the station by Celia Johnson herself in a remake of Brief Encounter. So effective has been this renaissance of public sculpture, it has even achieved the toughest alchemy in contemporary art: it has managed to turn art fairs into something worthwhile. Indeed, it has done so to the greediest, most crowded, least aesthetic event in London’s gallery calendar: the Frieze Art Fair. 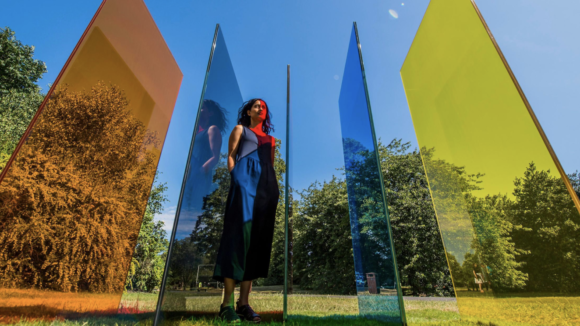 Now in its third year, Frieze Sculpture is a pop-up event, allied to FAF, that turns the flowerbeds of Regent’s Park into the charming location for an inventive display of contemporary sculpture. Like all sculpture parks, it works on the treasure-trail principle: you wander among the rose bushes and come across unexpected things. Regent’s Park is already delightful. When the sculpture arrives, it becomes a cutting-edge address, somewhere that fast-forwards you through contemporary aesthetics, an adventure playground for the jaded urban imagination. This year’s show is certainly a crowd-pleaser. There are labyrinths to blunder through. Magic towers to gaze up at. Gingerbread houses to encounter in the woods. So it’s a summer show with summer moods. But if that were all there was, it wouldn’t be enough. What makes this a genuinely useful event as well is the broad-brushstroking of contemporary dynamics that is going on. The first thing to notice is the range of materials and technologies being employed. Gone are the days when public sculpture involved a choice between stone and bronze. At FS 2018, the technological goody bag is raided relentlessly. 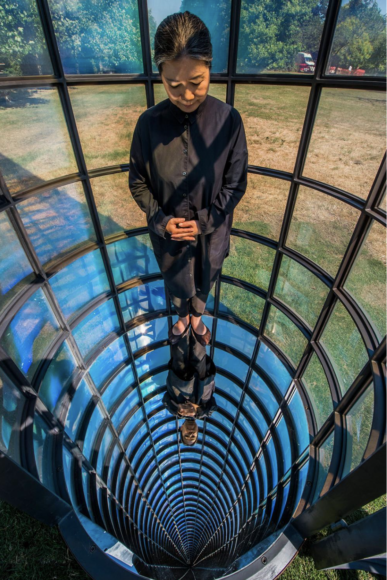 Dan Graham, veteran American light artist, gives us a glass pavilion that toggles your reflections from visible to invisible. 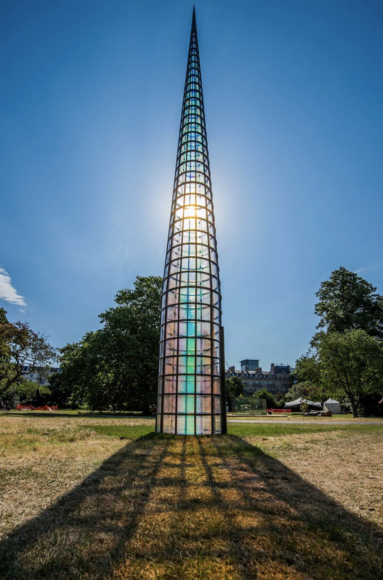 Kimsooja, a dreamy Korean sculptor, has created a giant steeple out of plastic transparencies that shimmer like oil on water. When you step inside, you find yourself endlessly repeated in a mirrored cosmos. “Far out,” I found myself mumbling nostalgically in the see-through steeple. This fondness for magical effects — the pursuit of the irrational — is another contemporary trademark. Conrad Shawcross’s Optic Labyrinth is a shiny aluminium palace, tall as a tree, that works in two ways. From close up, the spangled labyrinth can be wandered through claustrophobically. From far away, its fractured surfaces bounce the light into the distance as if it has been struck for a home run. Kiki Smith’s Seer is a ghostly statue of a girl contorted in a fakir’s pose and staring out spookily through blank eyes. Subtitled Alice 1, it’s a sculpture that feels as if it has been gobbling handfuls of psilocybin. This fondness for hippie effects extends into another of the show’s sculptural territories: the search for “diversity”. As well as Korean artists, we have sculptors here from Cuba, Bangladesh, India, Poland and South Africa. Just as being a middle-aged white man is the worst thing you can currently be at the BBC, so in art it has become the least desirable option. Thus, Bharti Ker, who lives in New Delhi, is represented by a strange bronze sculpture, 16ft tall, in which three female deities have been crudely Frankensteined into a single towering idol. Sawn into bits, jumbled up, the tripartite goddess feels unfinished and awkward. Roped together like a set of unwanted fence posts in a salvage yard, the poor jinn seem to have had their divinity traduced. Away from the hippie mysteries, a couple of exhibitors strike a unique note. Among the show’s failures is a stack of rusty steel plates dumped clumsily onto the lawns of the English Garden by the reliably ponderous Sean Scully. I have long known him to be an unimaginative and graceless painter. Now I know he is an even less graceful sculptor. 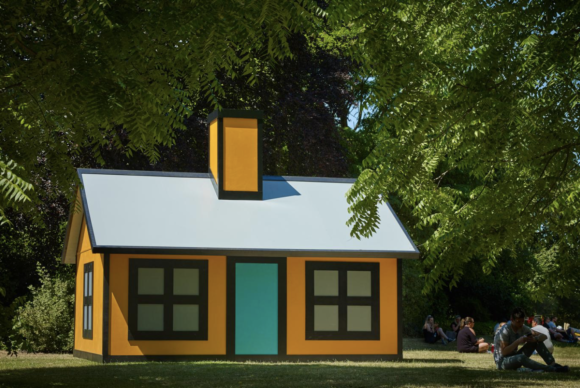 More successfully, in one of the show’s highlights, Richard Woods has created what he calls a Holiday Home, a dinky yellow cottage that looms up among the trees at the far end of the park. At first sight, I mistook it for another fairy-tale moment: the kind of hut in which a Goldilocks might encounter the three bears. But a bit of fiercer looking made it obvious that what Woods is really after is some wonky interdimensional slippage. With its thick black outlines and flat paintwork, the cottage looks, from afar, like an animation cell overlaid onto the real gardens of Regent’s Park. The result is a Roger Rabbit effect, a mash-up of visual dimensions, cleverly achieved. But to get back to the show’s generalisations — the fourth insight, if you’re counting — there’s a recurring interest in the natural world. Half of the 25 exhibitors refer in some way to the example of nature. The most direct is John Baldessari, the venerable American conceptualist, who ignores the fact that he is 87 years old by confronting us with a giant penguin that has escaped from London Zoo — conceptually, of course — and is now waddling its way in the general direction of Soho. Three of the animal sculptors stand out. All deal, gloomily, with the especially emotive symbolism of birds. The Scandinavian duo Elmgreen & Dragset have sculpted a scraggy tree from which a doomy vulture surveys the surrounding gardens, as if waiting for a tourist to drop dead so it can pick their bones. Kathleen Ryan, the most exciting and original sculptor here, has bashed together a concrete perch on which sit two lumpy green parakeets of the sort that has invaded most of London’s parks. Thus, a paradisiacal mood has warped into one that feels toxic and Hitchcocky. Tracey Emin completes the avian set with a cluster of tall poles on which sits a flock of mismatched songbirds, tiny and poignant. Each bird is slightly different from the one next to it. The feeling also persists that each is the last in an unhappy migration: the bird that missed the boat.